Sign up for Broadjam today to follow McKinley, and be notified when they upload new stuff or update their news! McKinley grew up in Anchorage, Alaska. She then went to a girl's Catholic high school in the San Francisco area. After earning a mechanical engineering degree at Cal Poly, where she played electric bass in her first band, she moved to London, working and writing music there. After a bicycle trip through Israel in which she was escorted out of the West Bank by an army jeep, she moved back to the city of her birth, Seattle, and began recording her songs on 4-track. 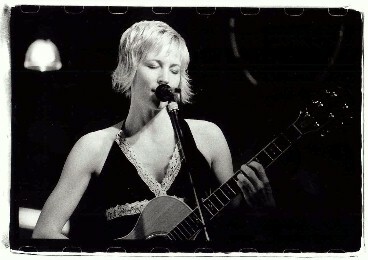 McKinley released her first self-made EP in Portland, Then, Santana's original drummer, Michael Shrieve, signed her to a new record label, Gold Circle. She recorded "Big Top Shop Talk" in New York and it was released nationally. McKinley toured with her label mate, David Crosby as his opening act. I really enjoyed the Live at the Laurel Thirst version. Interesting song.